The general consensus in sports is that the hotter and more humid the weather is, the farther a ball will travel. So it should be no surprise that, on what may have been the hottest regular season Eagles game in the history of Lincoln Financial Field, kicker Jake Elliott kicked the longest field goal in Eagles history to win the game. 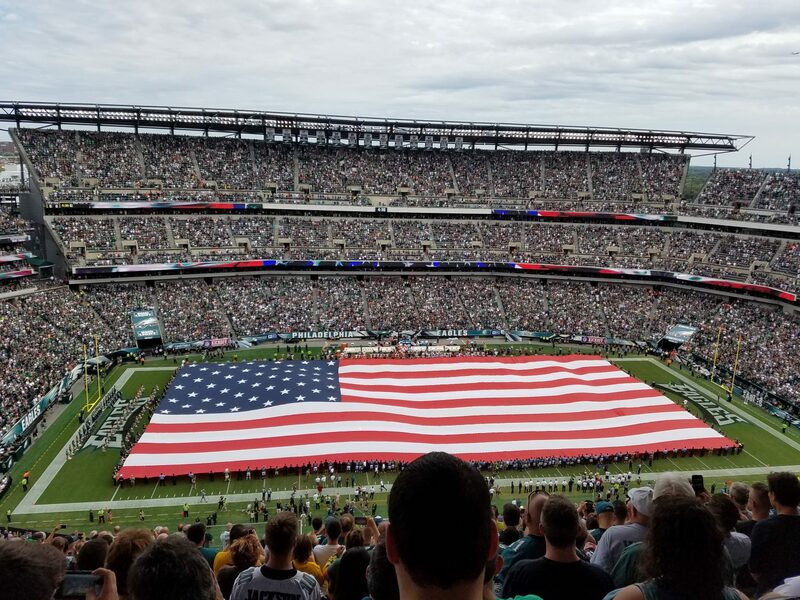 In a home opener that resembled a playoff frenzy atmosphere more reminiscent of a cold January day, the Eagles allowed a 14-0 lead to slip away, getting behind 21-14 & 24-21 before Elliott’s game-winning kick. The rookie, who was drafted by the Cincinnati Bengals as a 5th round pick, but who’s career hit a pitfall of sorts when he didn’t win the Bengals job to start the season, was signed off of the Bengals practice squad to replace injured kicker Caleb Sturgis. After the tense, game winning 61-yard field goal, the kicker was carried off the field by his teammates in a game that will be remembered for the ages, if only for how it ended. Elliott hit the ball so far that if the pigskin was E.T., he would have been able to send him back without having to “phone home” first. In the worst case scenario, Jake Elliott just experienced his fifteen minutes of fame…a moment he can proudly tell his grandkids about one day. In the best case scenario, Elliott takes over the kicking duties permanently from Caleb Sturgis and becomes the Birds field goal specialist for years to come, much like little known David Akers eventually did during the Andy Reid era. But for that, he will have to work on his consistency, which has been shaky. As astutely pointed out by Eagles postgame analyst and hall-of-fame writer Ray Didinger, it was the “shank” punt by Giants punter Brad Wing on New York’s last possession, which only traveled 28 yards, that gave the Eagles even a shot to try a winning field goal to began with. If Wing gets off even an average punt in that scenario, the game most likely goes to overtime. The irony is that once again, it was a mishap by a Giants punter that enabled the Eagles to win the game. As you may recall, it was Giants punter Matt Dodge who kicked to DeSean Jackson when his coach told him not to, that enabled the Birds to win on the final play in a comeback, miracle win against the Giants at the Meadowlands back in 2010. But while the game and the excitement of the kick had the Eagles fans singing Kool & the Gang’s “Celebration”, the win masked what were some obvious problems that the Birds have. For starters, Doug Pederson’s aggressiveness in going for it on a 4th down & 8 from the Giants 43 caused much consternation and understandably so. The play resulted in Carson Wentz getting sacked, which enabled the Giants to drive down the field and almost score a touchdown, if not for the Eagles defense tightening up on 4th and goal. Pederson was asked about his thought process in going for it there, in which he replied that he had consulted with his analytics guy before making the decision. One can only assume that the analytics guy is a five-year-old who invoked the nursery rhyme “Eeny, Meeny, Miny, Mo” as his analytical process? If New York scores there, and the Eagles lose this game by seven points, the head coach would have understandably been on the hotseat by the media and the fans. And while it’s one thing to be aggressive, it’s another to make foolhardy decisions, which is precisely why I don’t think that “Dougie P” will be the head coach when this team is ready to compete for a Super Bowl. The luck of the Irish may have been on Pederson’s side last week. But how long before his good fortune hits the stroke of midnight in a game that is being played for much higher stakes? For now though, all is well in Eagles land with an upcoming trip to the land of sun, surf, and the famous “In-N-Out Burger” as the Birds face the Los Angeles Chargers this Sunday (the football team formerly known as the San Diego Chargers). The Chargers moved to Los Angeles (LA) from their longtime home of San Diego because someone is convinced that people in LA actually care about NFL football. And ironically, after winning the game on a long kick, the Birds will now play in a stadium in which the predominate sport played there is with your leg (soccer). Stubhub Center, the temporary home of the Chargers, seats 27,000, which is about 15,000 less than even most traditional baseball stadiums seat these days. And while a road game on the west coast is usually a cause for concern for an east coast team, there may actually be more Eagles fans at this game than Chargers fans. Because frankly, most LA residents would probably prefer to hit around a beach ball at a Dodgers game than go see an NFL game in person. Add to that the fact that the only fans that travel better than Birds fans are Steelers fans, and you have the makings of a west coast Eagles home game. Just replace the crab fries and cheesesteaks with burritos and you’re all set. For that reason, I think Eagles win, 27-20, though once again, it will be a close game. And if you happen to be in the stands and are looking for the LA natives, just look for the ones with the beach ball. This entry was posted in Eagles, football, NFL, Sports, Uncategorized and tagged Brad Wing, carson wentz, doug pederson, Los Angeles Chargers, Philadelphia Eagles, Ray Didinger. Bookmark the permalink.